There’s still time to order your SaveAround entertainment coupon books and receive them by Christmas. ALL orders with promo code SAVERS will be shipped in time for Christmas Day if ordered by Thursday, 12/22, at 12 pm EST!! These entertainment coupon books will make great Christmas gifts for the person on your list who likes to save money with coupons for local grocery stores, events, restaurants and more. They’re also great to have on hand for yourself. The book for my area has coupons for the SC Philharmonic, which makes for a cheap fancy date night. The book also comes with a coupon for the golf course near our house, which is great to have when my dad or father-in-law come into town! Right now through 12/31/16 you can earn Amazon gift cards with every book you buy when you use the code SAVERS at checkout. Heads up… The gift card won’t display in your cart. 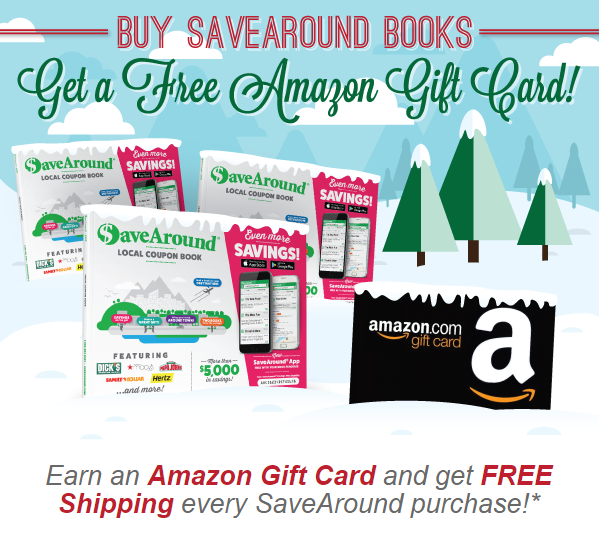 SaveAround will send you a digital Amazon Gift Card no later than January 3, 2017 to the email address you provide at Checkout based on the number of books you order. This post is sponsored by SaveAround, but all opinions are 100% my own.